Editor’s note: This is my regular weekly column in the Wanganui Chronicle. Periodically we hear talk of “innovation” in and around our River City. The term is spouted, touted and the “innovators” are outed. But from what I can tell, innovation must be a lot like beauty: it is in the eye of the beholder. In other words, many of the so-called innovations are simply not very original and/or useful to society. Meanwhile, what I consider one of the most innovative local businesses has gone unrecognized for its success and even moderate growth despite considerable headwinds. Who is that business? You’re holding it. 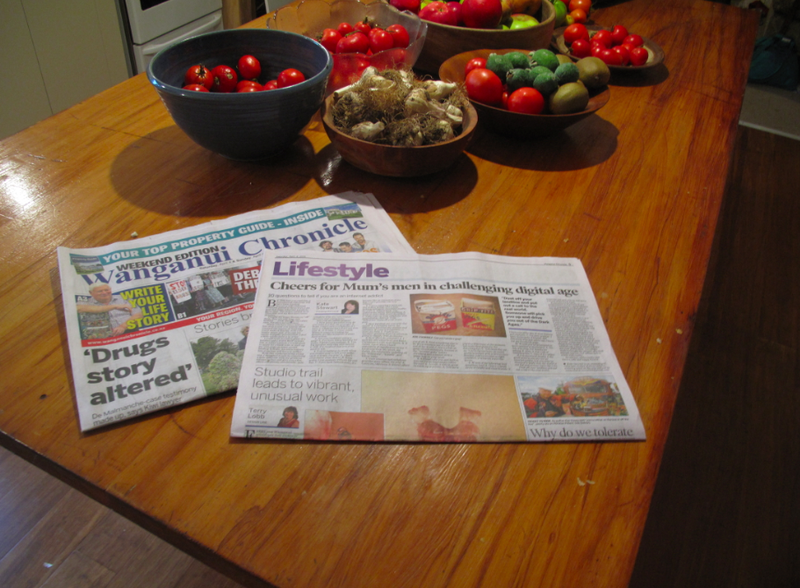 The Wanganui Chronicle is a thriving regional newspaper in an age of global print media decline. For example, the New Orleans Times Picayune reduced its print run to a Wednesday/Friday/Sunday schedule in 2012. The New Orleans metropolitan area has a population of around 1.2 million. Compare that to the Whanganui region. I’ll admit that New Orleans had been through hard times, so I’ll give another example. In 2009, the new owners of the Boston Globe – one of the finest newspapers is America – aggressively pursued $20 million (US) in cost savings due to decreasing revenues. As with any business, there’s income and expenses. As income is squeezed and expenses rise or remain static, innovation is essential. Although there are probably many innovations of which I am unaware, I’ll mention a few here. Three years ago this week the Chronicle launched its tabloid-style Monday-Friday paper and its new-look weekend broadsheet edition. These changes were accompanied by the beginning of a trend in regular local columnists of which we three on page B5 were the first. (Happy Anniversary Terry and Kate!) With over a dozen local writers now contributing regular weekly columns, the Chronicle is supplied with abundant, relevant, and shall we say “cost effective” content to fill the pages with issues that matter to our community. Let’s classify the above changes to the Chronicle as right-sizing and using local resources. 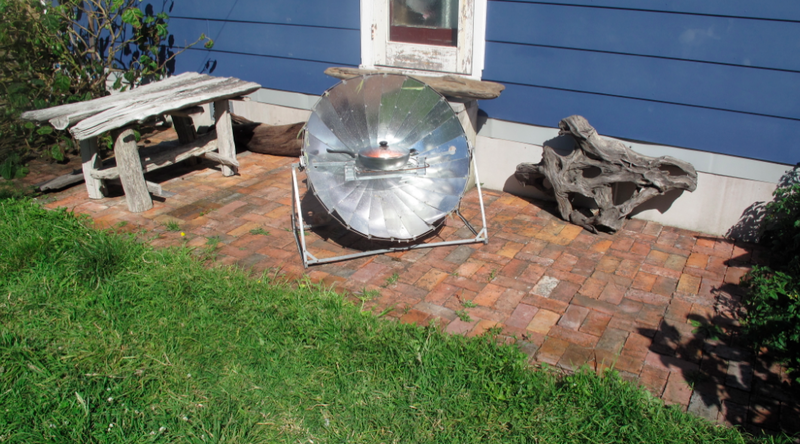 From one perspective, these can be considered eco-thrifty strategies. Add to these the fact that APN shares printing presses with rival publisher Fairfax, and you have a series of innovative, cost-effective measures that ensure our local paper continues to publish six days a week. 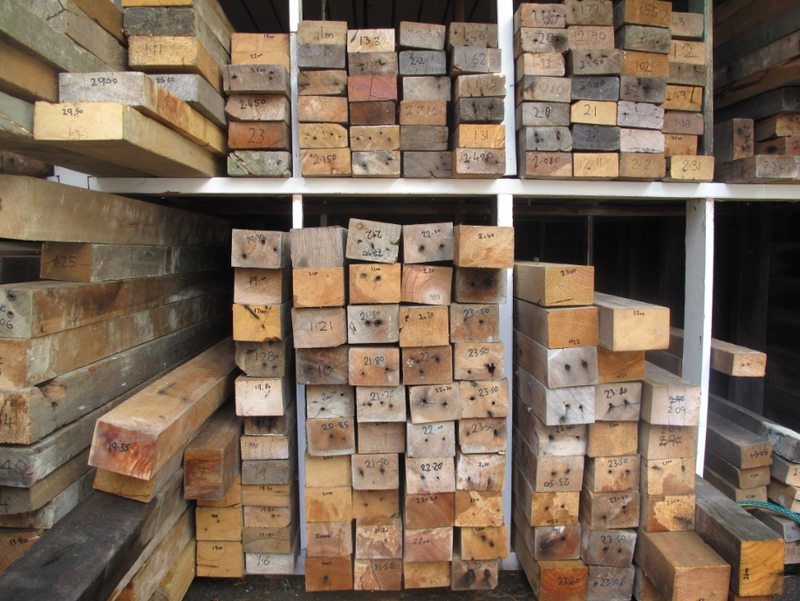 “In an effort to contribute to a more sustainable environment and conserve native forests, we are recycling treated and non-treated timber that would otherwise go to landfill here in The Manawatu, extending to other regions in the near future. “Some of us at RTT have faced barriers to working, and as a Social Enterprise we actively try to help others find employment by offering work experience and volunteering opportunities. Many of our volunteers have found employment. 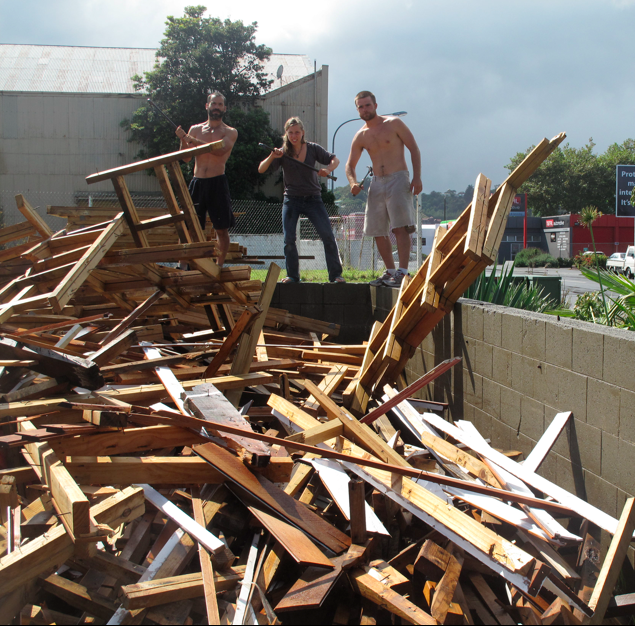 If that was not enough to earn this tiny organisation huge praise, they also provide shipping containers full of reclaimed building materials to international disaster areas. This function is facilitated by their charitable arm, Human Aid Focus. 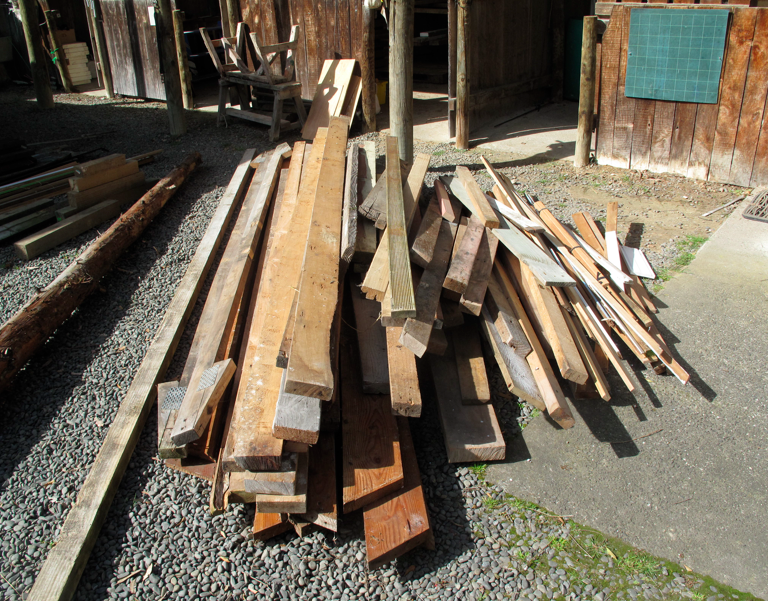 I recently purchased a selection of native timbers to frame a kitchen island. 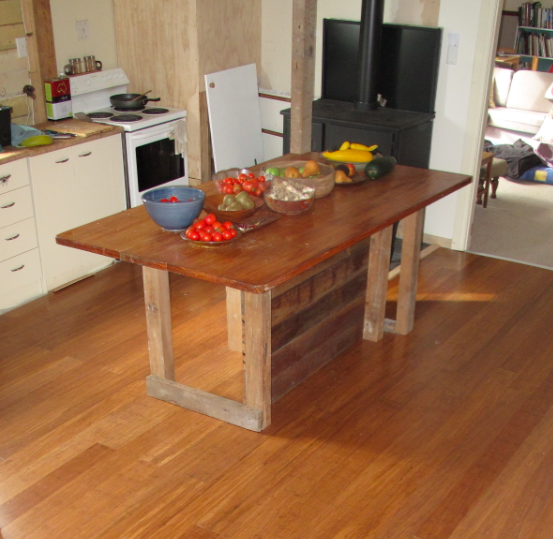 While the top is a reclaimed rimu bar I bought on Trade Me last winter, the matai legs come from RTT, and the tounge and groove is the former lean-to ceiling of our Castlecliff villa. Total cost: $107. For regular readers of this column it is obvious that energy efficiency is a major part of eco-thrifty renovation. From an energy perspective, the ‘eco’ need only stand for economic because the financial benefits are so easy to document. One need not have any green intentions to fully embrace energy efficiency on a purely fiscal basis. The Scrougiest Scrouge and the Grinchiest Grinch should be all over LED light bulbs, insulation, and Energy Star appliances. The financial payback of many energy efficiency measures gives a better return than the best term deposit available. Additionally, there are the intangible benefits of comfort, health and family well-being. But there is another aspect of eco-thrifty renovation that does not offer such clear financial payback, and may in some cases cost more than bog standard conventional building practices. 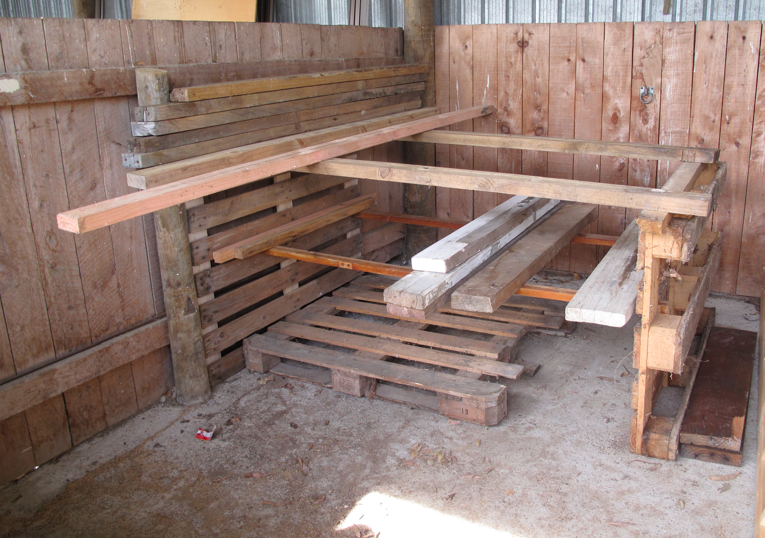 This involves reusing materials, which in most cases is labour intensive. If you pay a builder to do it the cost comes in wages. If you do it yourself the cost comes in time. In either case, the costs can often be justified by a unique and beautiful product. Character and craftsmanship are worth paying for in the same way that good artwork is worth paying for. Personally, I pay in blisters, abrasions, sawdust up my nose, small cuts on my hands, and a sweaty brow. 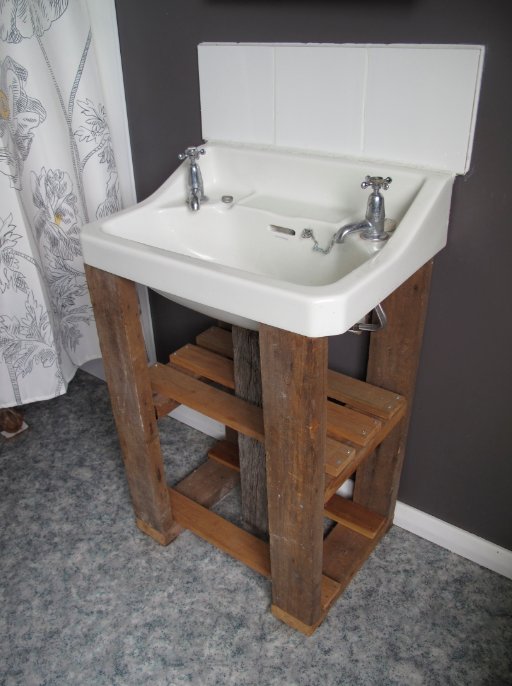 Reusing materials is a labour of love. 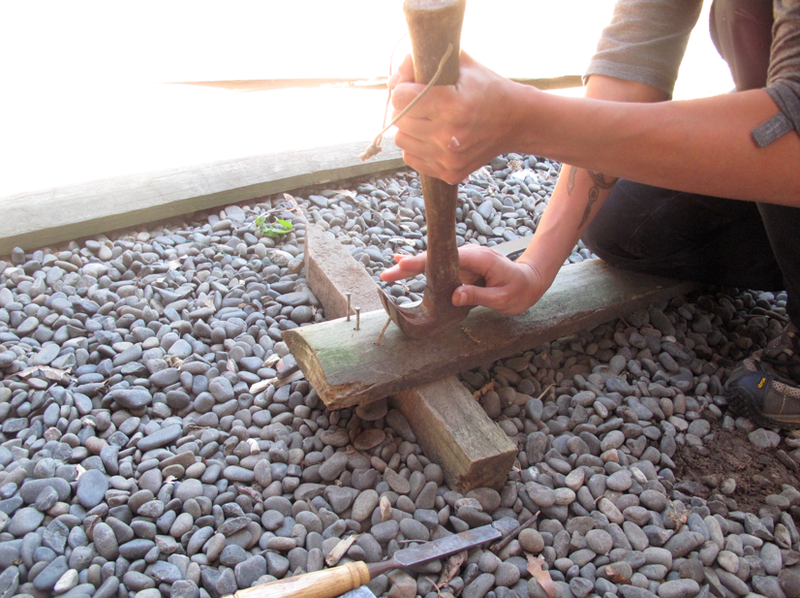 Reusing materials forces one to work slowly; to be mindful; to focus on beauty rather than speed. It is a welcome break in a busy world. 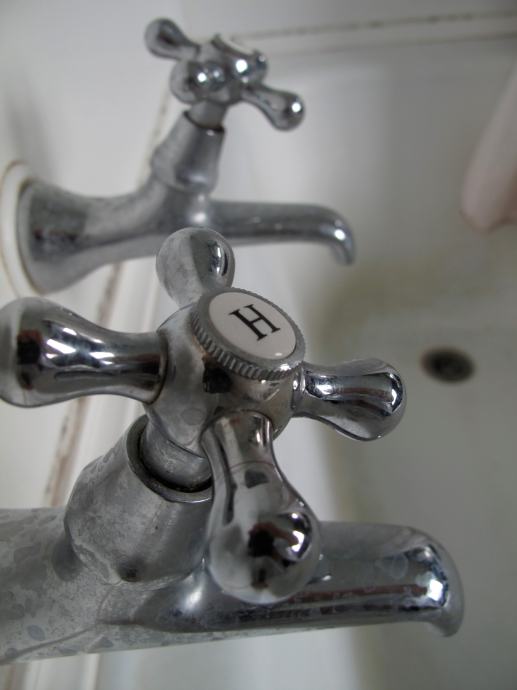 One interesting feature in our bathroom came as a result of a clumsy plumber. While placing the basin on top of the porcelin pedestal four years ago, the plumber cracked the top of the pedestal. He slapped a few pieces of black electrical tape on it and left. And so it remained for two years while I completed 267 other projects. 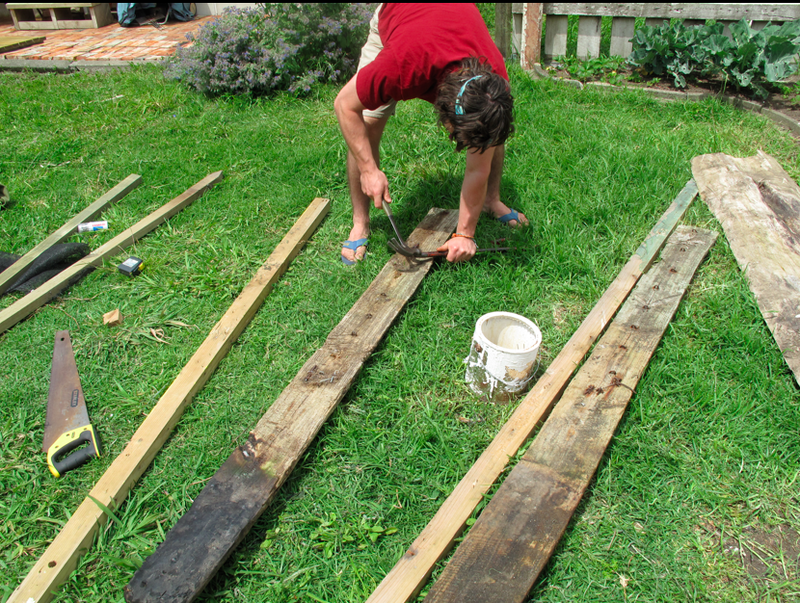 Then one day after my dissertation had been accepted, my family was away, and there were no waves at the North Mole, I crawled under the house and retrieved the rimu studs I had stored there in 2010. 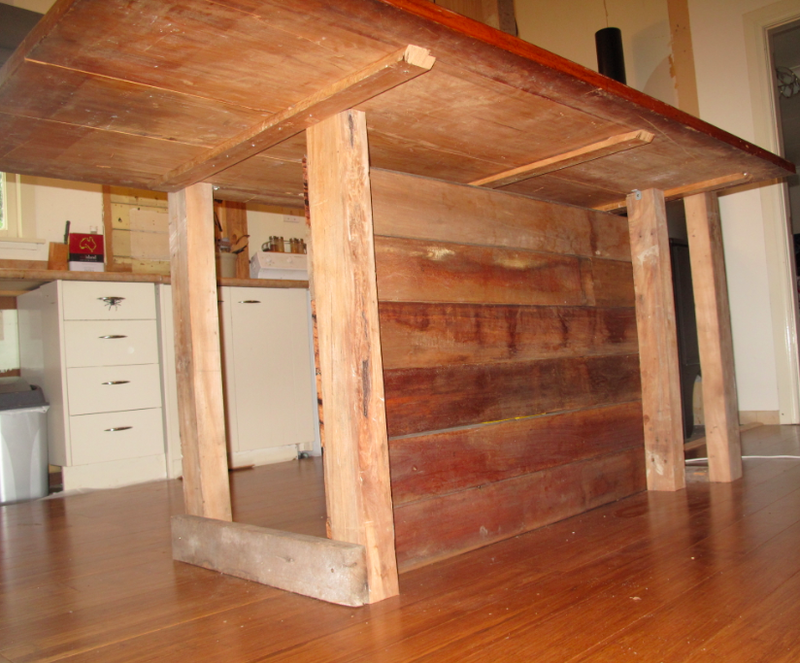 On a scale of craftsmanship, this project ranks fairly low, but one great thing about repurposing timber is that imperfections are just part of the character. Beware, however, there is a fine line between character and a dodgy job. 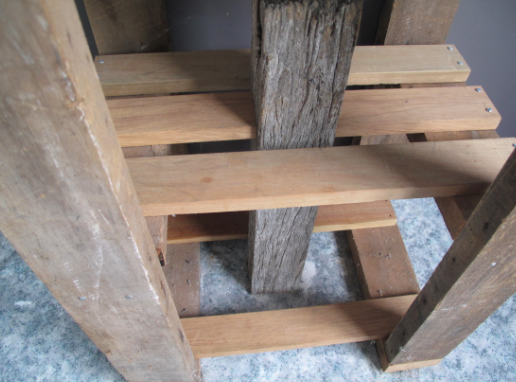 For this project I framed a shelf under the basin with the rough sawn rimu studs I had pulled out of our walls while reframing and adding insulation. The shelves themselves are dressed rimu from the old hospital in Aramoho that was pulled down last year. I bought it for $1 per metre. 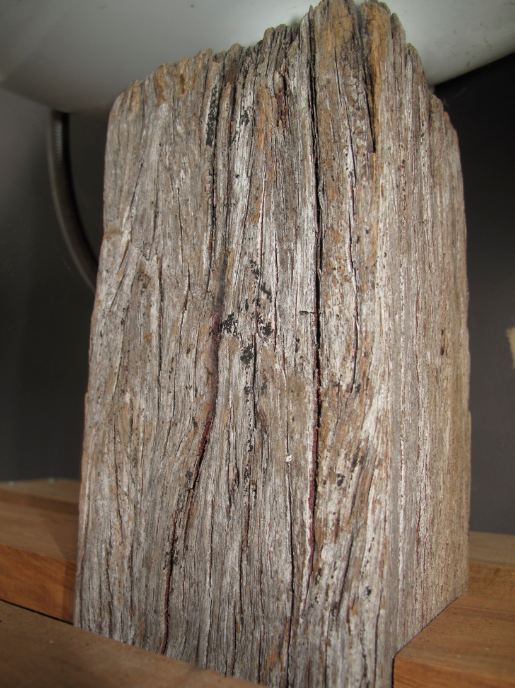 But for me, the coolest feature is the weathered post that conceals the drain – a job previously done by the cracked pedestal. I got the post from next door while rebuilding a fence for our neighbour. 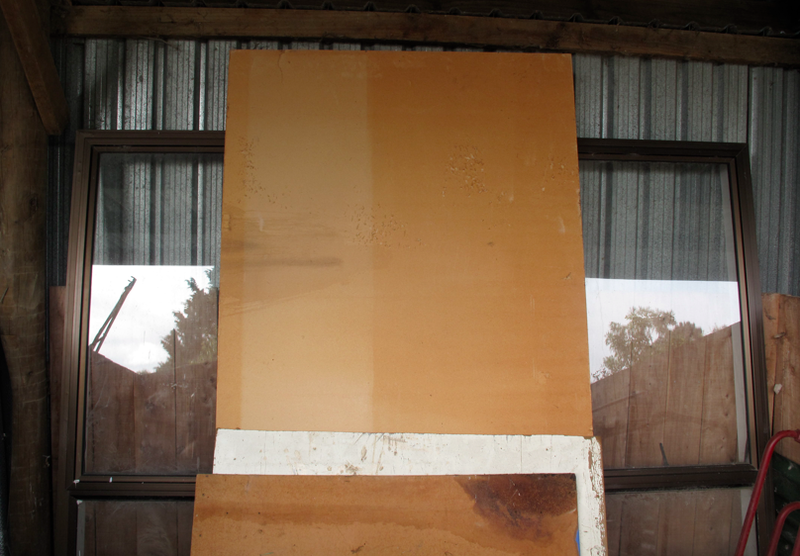 The totara ‘4-ba-4’ has beautiful raised grain and was weathered to a gorgeous colour by thirty years of coastal winds. I ripped a channel the length of the post and chiseled out the wood to create a cavity just wider than the drainpipe. In total, the project presents the vintage wood in a contemporary way. Mixing old and new is a style choice that can work well or can totally bomb. 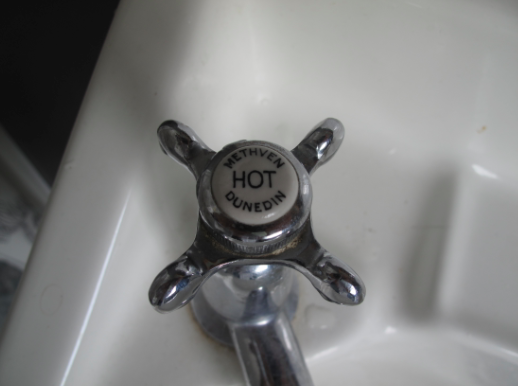 The age of the timbers are mirrored by the century-old Methven taps in the basin above them. We carried this theme throughout the bathroom with a vintage cast iron claw foot bathtub and reproduction retro taps to echo the Methvens. The vintage basin and tub stand out in the bathroom in part because of their character and in part because of the dark paint on the walls. The high gloss paint is easy to clean and reflects natural sunlight around the room from the giant north-facing windows. The space feels light and roomy, and is always warm even throughout winter. It is a welcoming space in all respects. 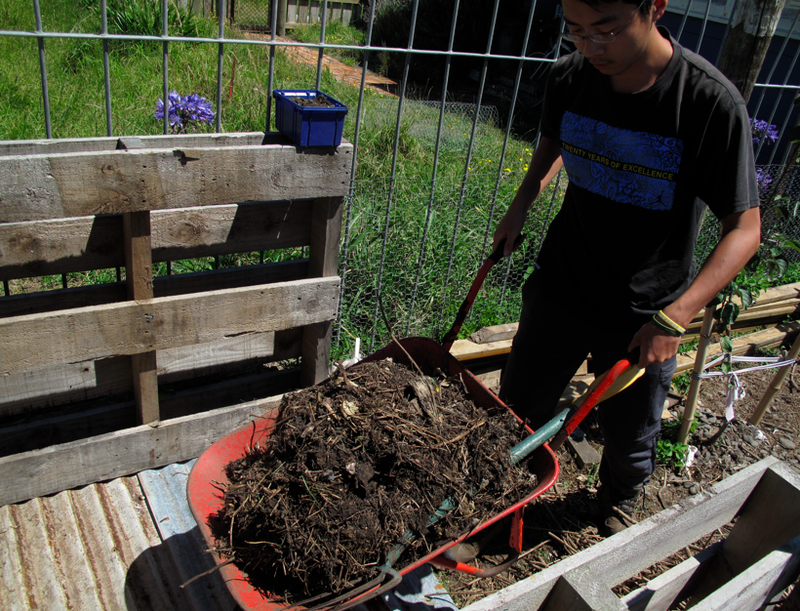 In my opinion, a large part of permaculture is having a stash of resources to draw on for building projects. The resources are usually acquired for free, or at very low cost. 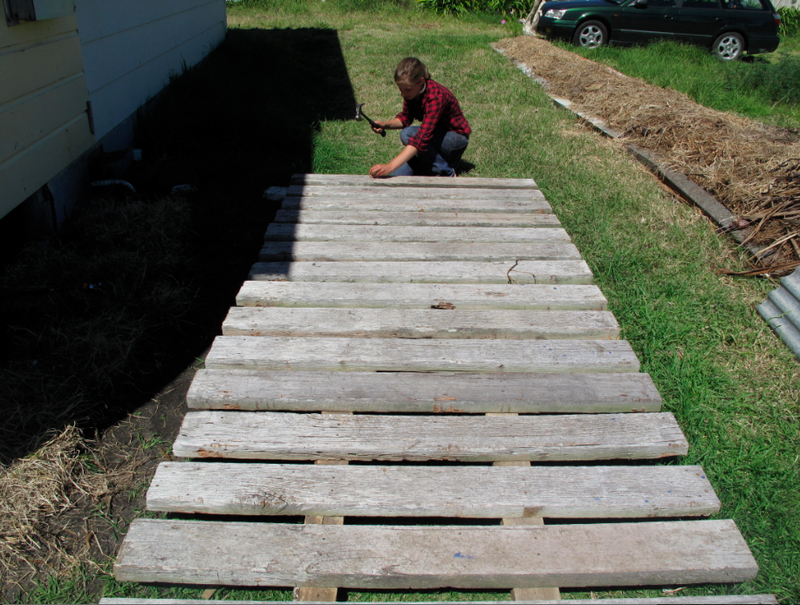 They can consist of wood, steel, glass, brick, concrete or organic matter. As long as you can store your resources out of the weather, you’re entitled to as many as you can collect. 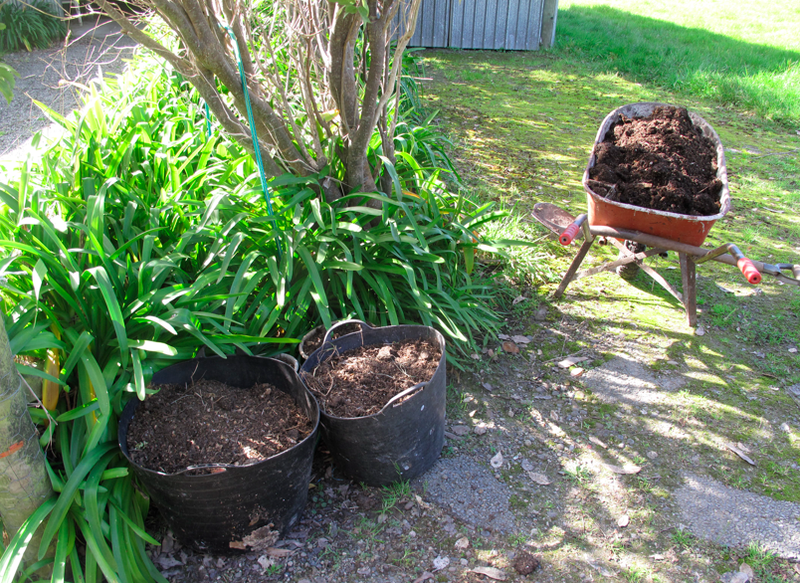 In the process of shifting, I discovered how many resources I had stored under the house and under roofing iron in the yard. First off, there was a lot of lumber with nails removed, as well as roofing iron. 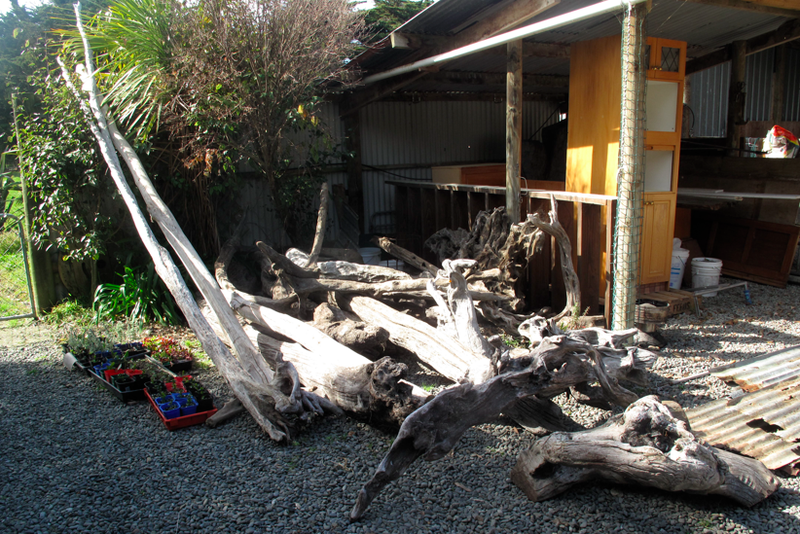 I moved my best pieces of driftwood for making cool stuff. 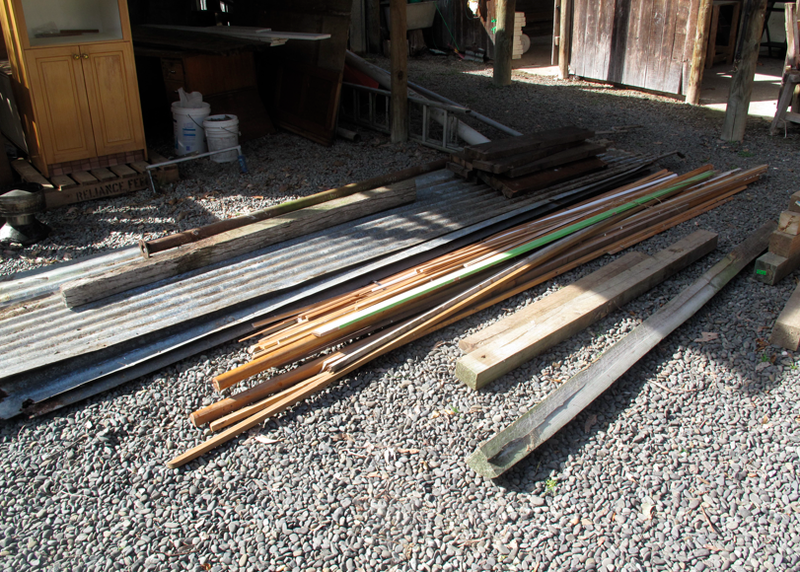 In the former horse stables, I am building a lumber rack. More wood and a giant window for reuse as a glasshouse. 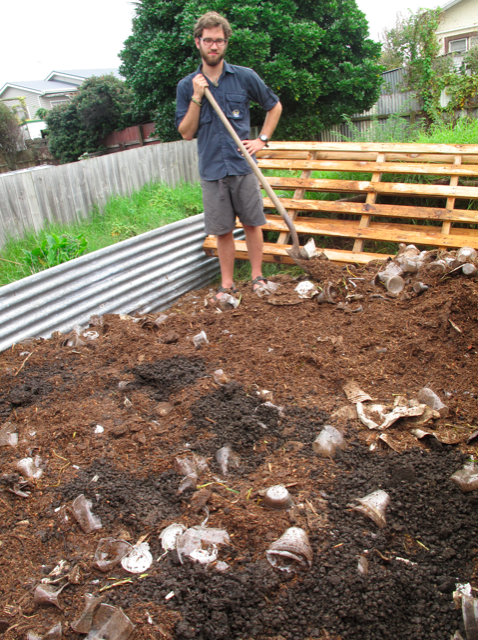 We ended up moving 2 cubic metres of compost. 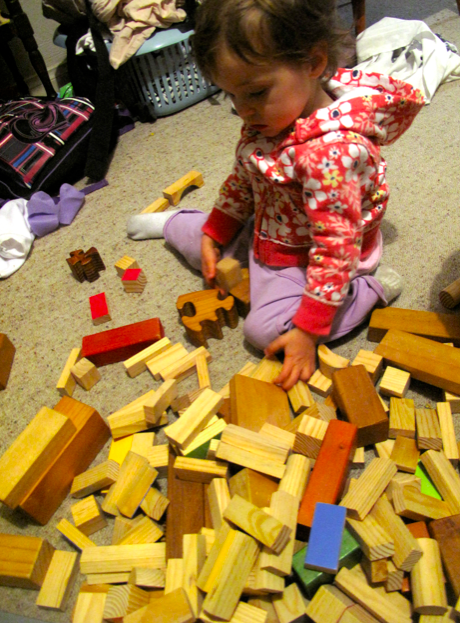 This is Verti sorting her lumber. Last week I marked the three-year anniversary of the arrival of our first two interns, John and Amy. That was an opportunity to share the story of the transformation of what was once a chimney in Gonville into our brick patio in Castlecliff. It was also a chance to talk about transformative learning, a process by which many adults undergo a profound change in the way they view the world. In order to undergo such a major shift of thinking, learners need a nudge, which can come in the form of a ‘disorienting dilemma’ or a ‘cognitive crisis’. In other words, something happens that renders unsatisfactory their current way of thinking. An easy example of this is a diabetes diagnosis that may force a change in ones view of diet and exercise. Other examples include the loss of a job or the break-up of a marriage. It should not be hard to recognize that these would alter ones perspective on financial security and relationships. For many people in the sustainability movement, transformative learning is sparked by a slow but cumulative body of evidence indicating that the current state of the world is unsustainable. Literally, it cannot be sustained. Trends in everything from ecosystem health to energy supplies to extreme weather events to income distribution show that we are headed for volatile times ahead. As such, the prudent and conservative thing to do is to look for systems on our planet that are more sustainable. For example, a forest ecosystem experiences a dynamic balance of plant and animal populations as well as materials recycling. 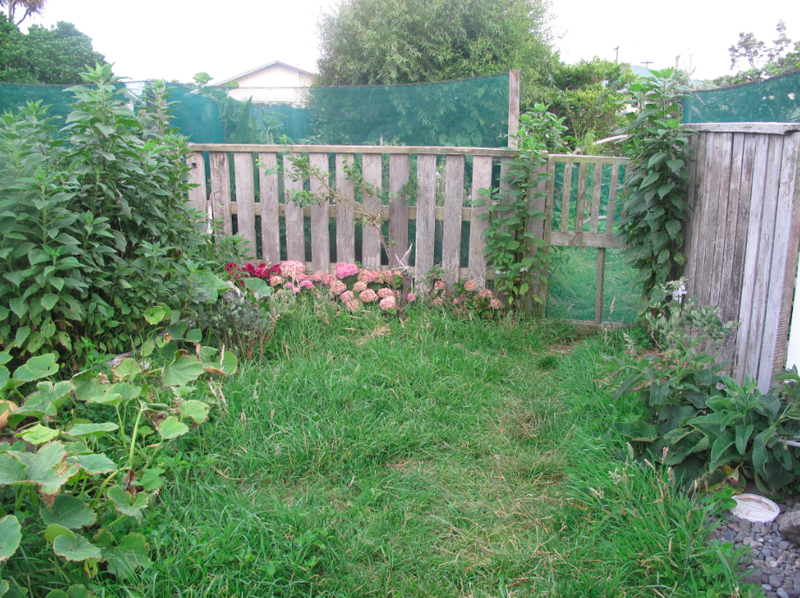 Observing such systems has led to the development of eco-design strategies such as permaculture. As one would expect, many adults experiencing a ‘cognitive crisis’ about the damage that Western consumer culture is inflicting on the planet and many of its people turn to permaculture as an alternative worldview. Because I knew John-the-intern before he came to us three years ago, I expected that he was already well on his way to developing an alternative worldview. But Amy came to us more or less as a stranger. When she left many months later, not only was she a friend, but also a young woman on a mission. 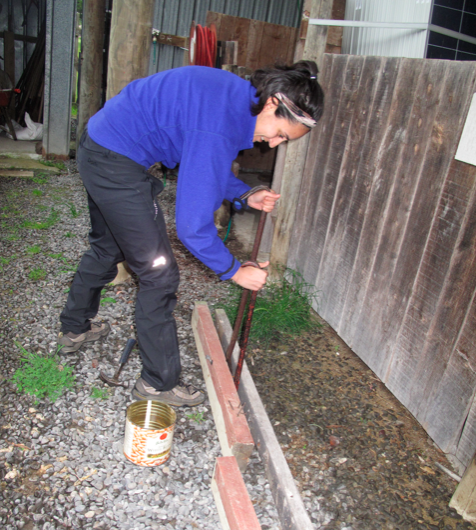 For Amy, it all started when she picked up a hammer and built us a fence. This was an empowering experience for a number of reasons. First, and most importantly, she chose the project herself from a long list of options. Second, I set her up for success by providing enough structure that the project could be accomplished with her limited building experience at the time. Third, it looks awesome! In the same way that John transformed a chimney into a patio, Amy transformed our former deck into a beautiful and functional fence. Also like John, her experience served as a steppingstone along a path to a more sustainable worldview. Two and a half years after she left us, that path recently led Amy to the International Permaculture Congress in Cuba in December of 2013. 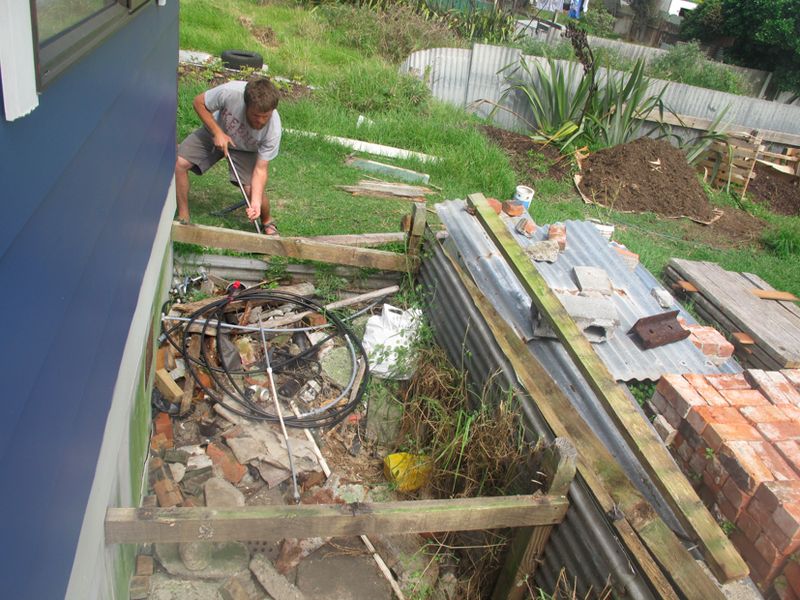 Interesting how transforming our little villa here in Whanganui has helped transform a few young minds along the way. We’ve just passed the third anniversary of the arrival of our first two interns. John Wright was a former student of mine from my high school teaching days, and Amy Lamb came to us through her uncle, a good friend and groomsman at our wedding. 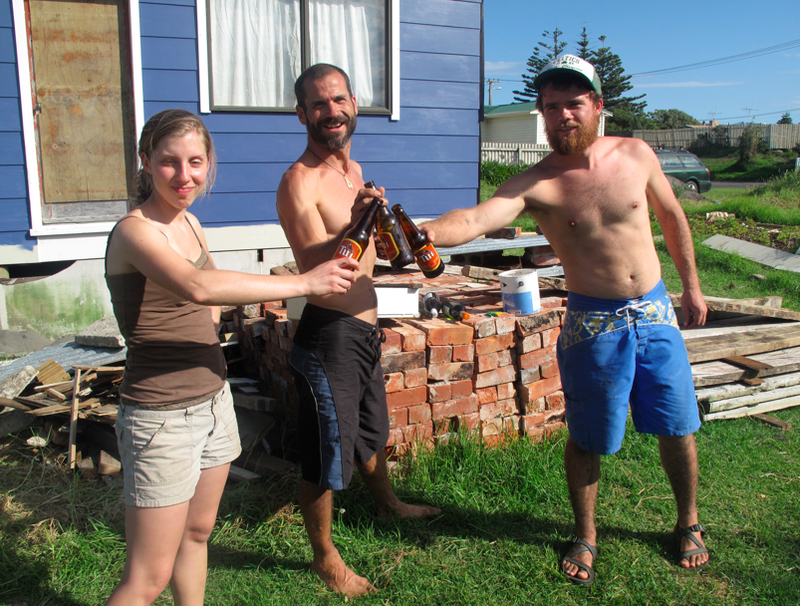 They were both in their early twenties when they arrived in Whanganui in late summer, 2011. 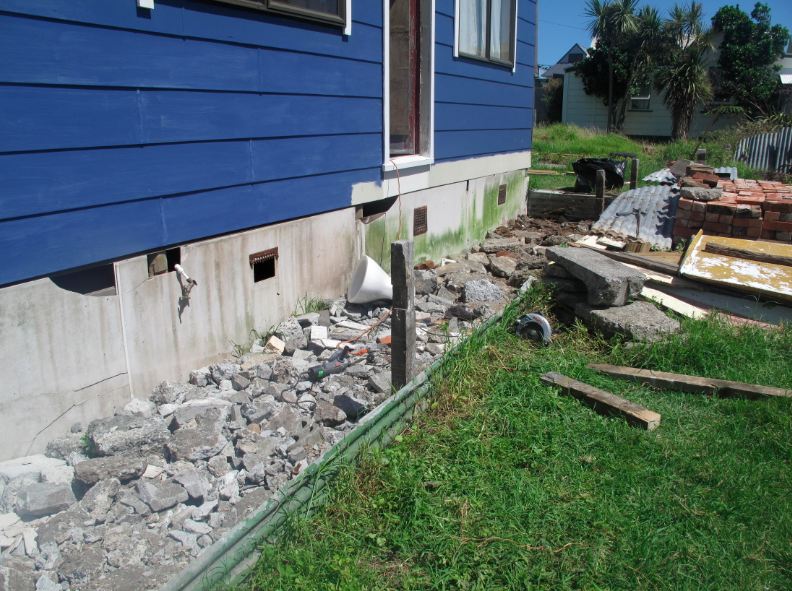 We were in the heart and guts of our renovation: ripping open walls, adding insulation, hanging Gib and weatherboards, installing solar hot water. Much of what we were doing at that time required close supervision, as it would be scrutinized by our building inspector. I’ll admit I was a bit of a taskmaster, which went over better with John than with Amy. John had come to us straight after 4 months on a lobster boat off the coast of Maine through a Northern winter. Amy was fresh out of uni, and looking for a gap year type of experience. By the time they left us, both had experienced transformative learning experiences on different levels. John returned to the states and immediately took up a lease on a two-acre organic vegetable farm. 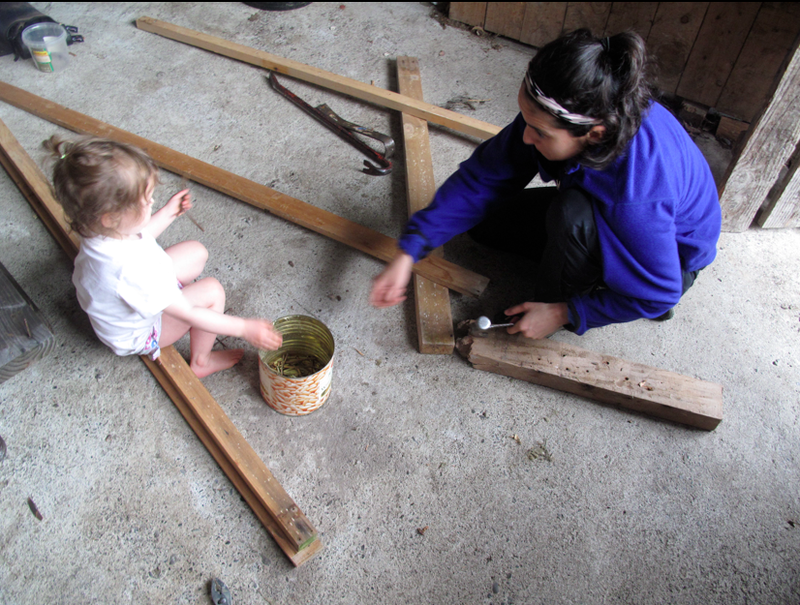 Amy took a job with a conservation organization, enrolled in a permaculture design course, and now works with a sustainable forestry consultant. Transformative learning theory stipulates that in order for one to transform their perspective they must first recognize that something is wrong with their current perspective, then look for alternatives, and eventually adopt a new worldview. For those like John and Amy, the Western consumer lifestyle messages bombarding them on a daily basis did not satisfy their need for meaning. They came to us and experienced some alternative worldviews such as sustainability, permaculture, and what we call eco-thrifty living. 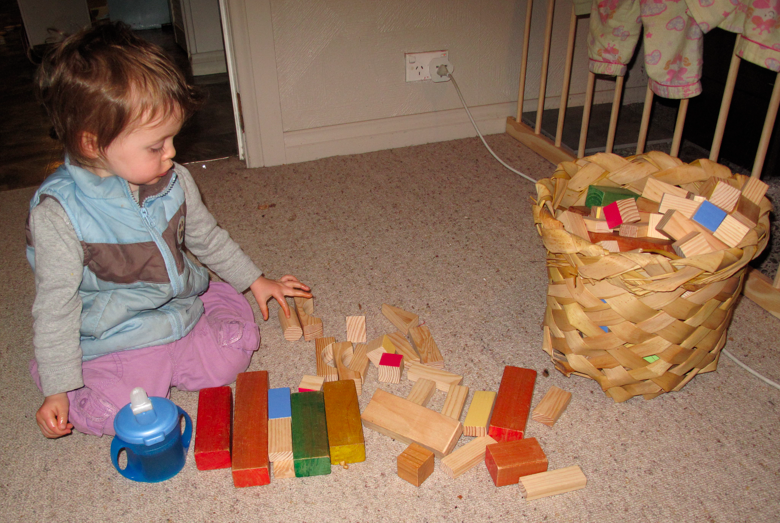 For the first month they spent with us, most of their ‘transformative learning’ took place outside of our nine to five workday dictated by the NZ Building Code. It took place over the dinner table, in the garden, and even during our weekly trips to Hayward’s Auctions. But as the pressure of pre-line and post-line inspections waned, I allowed John and Amy to select from a long list of non-consent jobs to engage with while I got back to writing my PhD thesis. 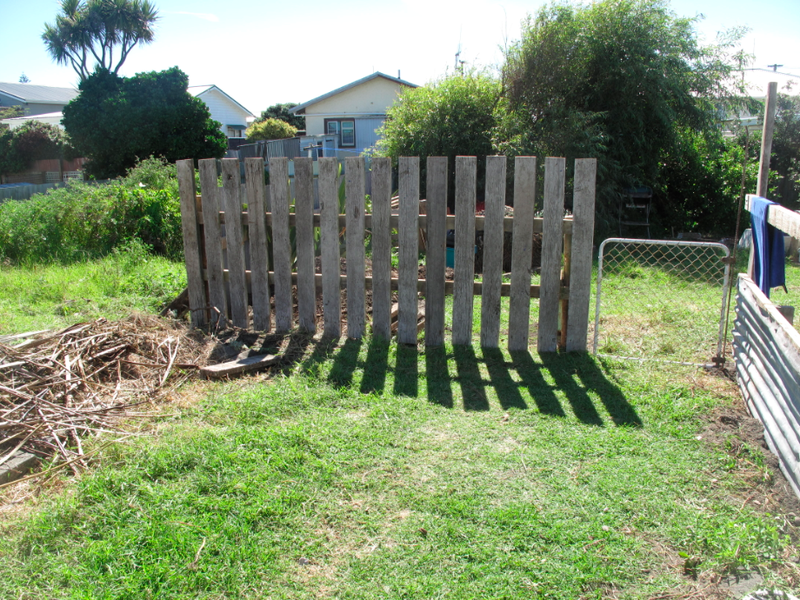 After building our outdoor pizza oven together, John embarked on laying second-hand brick for our patio and Amy set herself to constructing a fence. I’ll share John’s experience this week and Amy’s next week. In my 14-year teaching career, John was one of my top 10 favourite students. 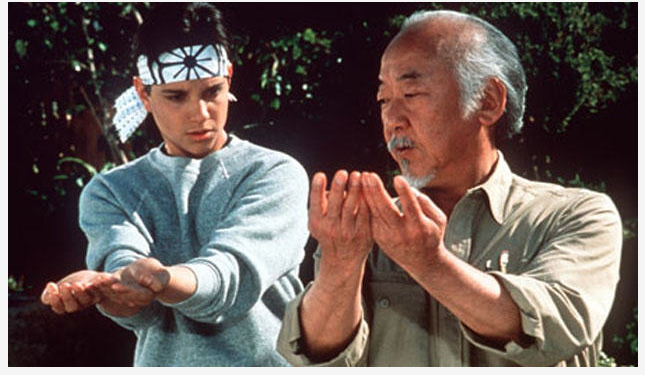 Although not a strong academic, he always worked hard, had fun, and was open to new ideas. He was just an awesome kid. I had no problem telling him to build me a patio and trusting he would do a good job. 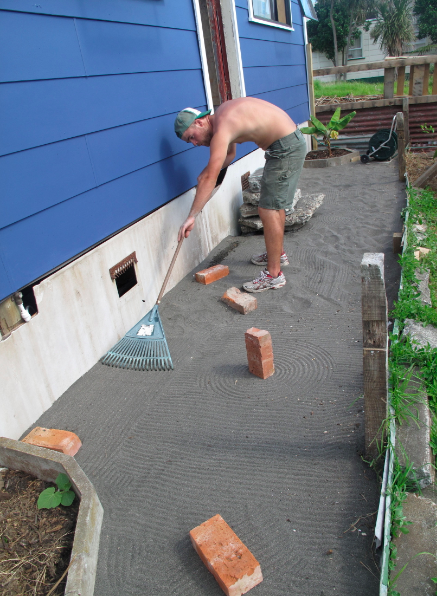 The bulk of the work involved carting many wheelbarrows of sand to fill and level out the trench beneath the former deck that was full of rubble and rubbish. 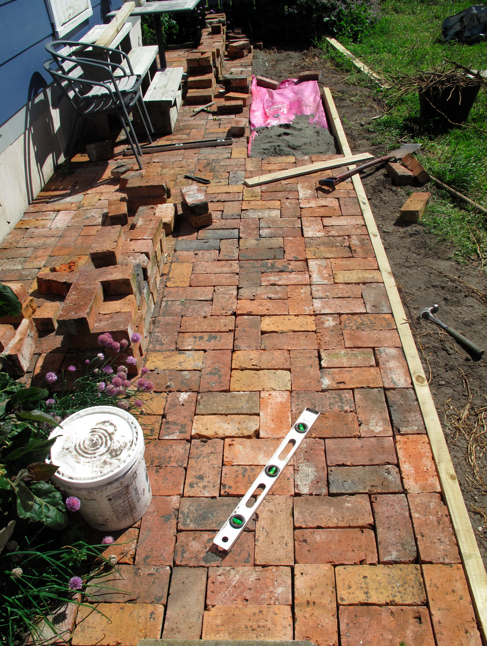 John was the perfect candidate for this job because he was strong as a horse, but also carefully used a leveling line to place each brick. John took ownership for the job and followed through with an amazing result more or less on his own. The project is a good example of eco-thrifty renovation because it involved second-hand materials, local materials, and free materials. With a little vision, hard work and patience, the bricks that made up a chimney in a Gonville home are now our patio in Castlecliff. What a transformation.